Did you know that you can now stay at Devon’s best family day out attraction, Crealy Resort and Adventure Park? We were invited to stay in a safari tent at Crealy Meadows with our 2 kids aged 4 and 6 years old. 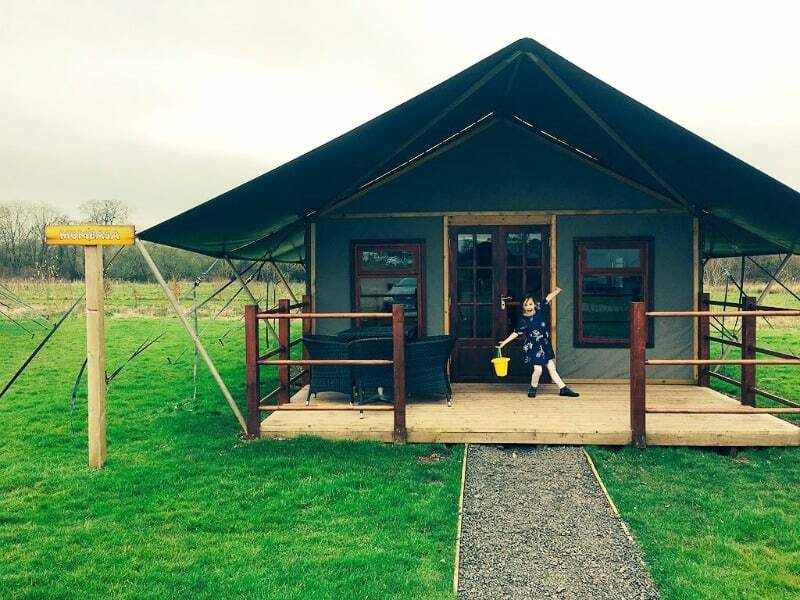 It could well be the best glamping in Devon for kids and here’s why. Why Choose Glamping at Crealy in Devon? Devon is a beautiful part of the English Riviera, as Indie and I discovered last year when we went otter hunting around Dartmoor. If you are looking to take a family holiday to the South of England, Devon is really accessible and has lots of things to see and do. For this family holiday we were delighted to be able to bring Daddy and Brook along to see what a glamping holiday in Devon was like. When we arrived I collected the information pack and our wristbands for entry into Crealy Resort. We were able to access the theme park for the duration of our stay. The receptionist was super helpful and could answer any questions we had both when we first arrived and whenever we popped in to the office to speak to someone. It was a very pleasant surprise to learn that Crealy Meadows had it’s own entrance to Crealy Great Adventure Park so we wouldn’t need to queue to get into the park when the kids were raring to go. We managed to walk straight in to Crealy every time we visited the park which was the perfect way to start our day out. The receptionist also gave us the evening entertainment program and told us that guests staying at Crealy Meadows got exclusive access to the theme park in the evening. There was a full program of organised entertainment and access to some of the park facilities in the evening meaning that the kids had somewhere fun to play. I thought this was fantastic, and I could definitely see us visiting the Adventure Zone and the mini disco later that evening with the kids. Is Glamping at Crealy Cramped? With four of us to consider, having enough space for us while staying in the safari tent was so important. One thing you get when you are glamping at Crealy Meadows is plenty of space. The safari tents are an excellent size sleeping between 6 and 8 people with 2 bedrooms (one with bunk beds) and another separate sleeping area as well as a sofa bed. All the beds provided were really comfortable but you do need to bring your own bedding. Outside there’s a large covered patio area with outdoor seating. It’s a great place to hang out in the evening and provides a place to leave boots and brollies if the English weather is on a downer. We could also park our car right outside our tent which was perfect if we’d been out for the day and for unpacking when we arrived. Inside the glamping tent it was toasty warm, as there are electric radiators throughout and the floor is fully carpeted. We really loved these creature comforts. We had a large wooden dining table for 6 people, a sofa for 2/3 people and a breakfast bar with 2 stools inside the tent. I would have liked to see a bit more comfortable seating, maybe an extra sofa, but it didn’t seem to affect our stay at all. What is the Kitchen inside the Safari Tent Like? I was really impressed with the kitchen inside our safari tent. It was fully kitted out with a sink and draining board, a 2 halogen ring hob, toaster, kettle, fridge with freezer compartment and a combination oven which sat on the counter. There was also plenty of pots, pans and crockery for us to use. Family meals in the safari tent were pretty easy to prepare to be honest. If you want a self catering holiday in Devon, glamping at Crealy Meadows is definitely an option. There were lots of features we thought were good for families who wanted to stay in safari tents at Crealy Meadows. There were real chests of drawers and plenty of storage for all our clothes, toys and suitcases. There’s plenty of windows throughout the whole tent for lots of natural light during the day, with blinds you can pull down at night. There’s a real front door that we could lock with a key so that all our personal possessions felt secure. We had free WiFi access while glamping and visiting the theme park. There was an electric powered light in the centre of the tent and lots of sockets throughout for charging things or plugging in portable devices. What about the rest of the Camping and Caravan Park? We didn’t have our own bathroom or toilet in the safari tent, but there was an excellent shower block close by and the route was well lit so you would getaway without having a torch. We really loved the family bathroom which had a shower, 2 toilets and a bath. 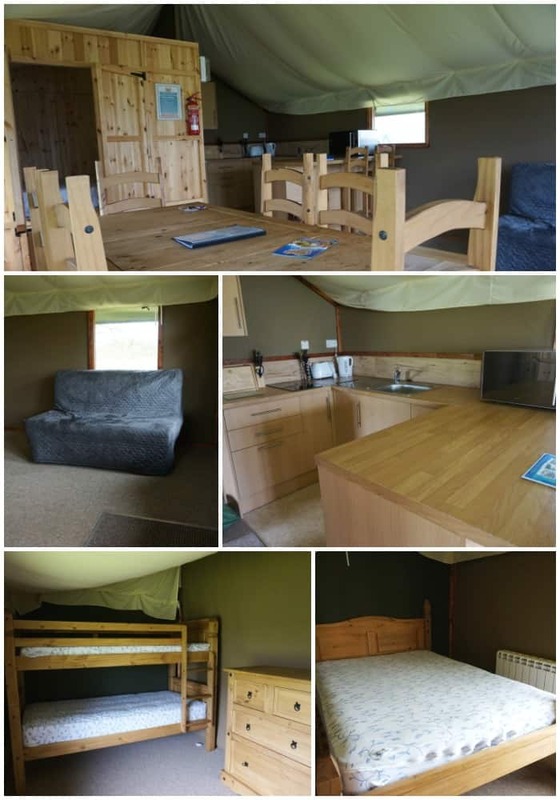 As well as the safari tents at Crealy Meadows, there are also spaces for tents and caravans and there are also lodges to stay in. There are some lodges with hot tubs available if you want to add an extra special treat to your holiday in Devon. There is also a small shop with essential supplies in the reception and a club house that serves breakfasts and evening meals. There is also evening entertainment here and a happy hour if you don’t want to venture into the main park. There are outdoor play areas around the park and you can also hire fun bikes and trikes for the kids to use around Crealy Meadows to help them burn off some excess energy. During the majority of our stay at Crealy Meadows we made use of visiting the adventure park. When we gave the girls the choice of what they wanted to do, going to Crealy was their first choice every time. This is a great theme park for small children and it literally won their hearts from the outset. Having it on our doorstep was such a bonus too. When you stay at Crealy Meadows you have access to the park for your whole stay, including the day you leave. If you’re worried about finding things to do with kids in Devon or trying to manage your holiday budget staying at Crealy is a great option. Whenever you are in the park during the main opening hours you have access to all the rides and play areas. During our time at Crealy Adventure Park we realised Brook is quite the daredevil. She was happy to go on all the kids rides and rollercoasters. Indie has always been a bit more cautious when it comes to going on kids rides, so it was Brook’s turn to bring Indie out of her shell a bit. Brook didn’t hesitate when it came to the rollercoaster so when Indie saw how brave she was, she didn’t want to be left out. What if it rains while your visiting Crealy? There is a great mix of outdoor rides and attractions as well as indoor play areas and activities. Our favourite indoor play area was Atlantis, which has both indoor soft play and 3 or 4 rides the kids can go on. Next door is the Adventure Zone with a games room and huge soft play and some almost sheer drop slides for the particularly brave. We also really enjoyed the variety that Crealy Adventure Park had to offer mixing traditional rides like the High Swings with the Driving School which was the girls favourite ride by far. There’s also indoor and outdoor areas where you can meet the animals that live at Crealy including the meerkats and the reptiles. Driving School at @CrealyResort is a fab way for little kids to have big world fun! We also really enjoyed going into the park in the evening when it reopened for Crealy Meadows guests. The entertainment staff were lovely and the kids got to burn off what remaining energy they had at the disco or on the soft play. There were also quizzes and games of bingo if you wanted to join in, but for us we had to get the girls back to the tent around bedtime to make sure they were ready to go for the next day of fun. 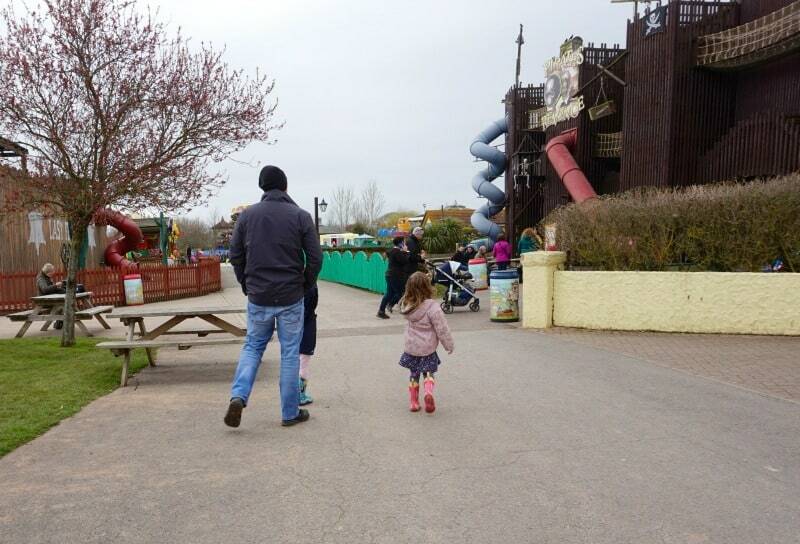 We really enjoyed our stay at Crealy Meadows and being able to visit Crealy Great Adventure Park in Devon. The kids loved the holiday from beginning to end and it was lovely having access to so many things to do when we needed it. No one said they were bored once! We’re finishing our first day @CrealyResort on a high! When you’re #glamping at the resort you get to enjoy some great park facilities & entertainment when everyone else has gone home. That’s definitely #winning we think! The safari tent we stayed in was great and the holiday park on the whole had excellent facilities for glamping. 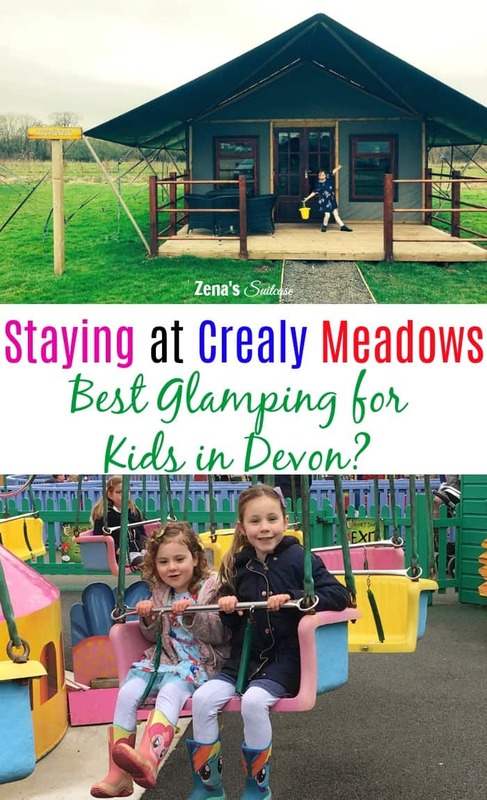 We would happily included a stay at Crealy Meadows in our Devon holiday plans again, but next time we would love to upgrade to a lodge with a hot tub! 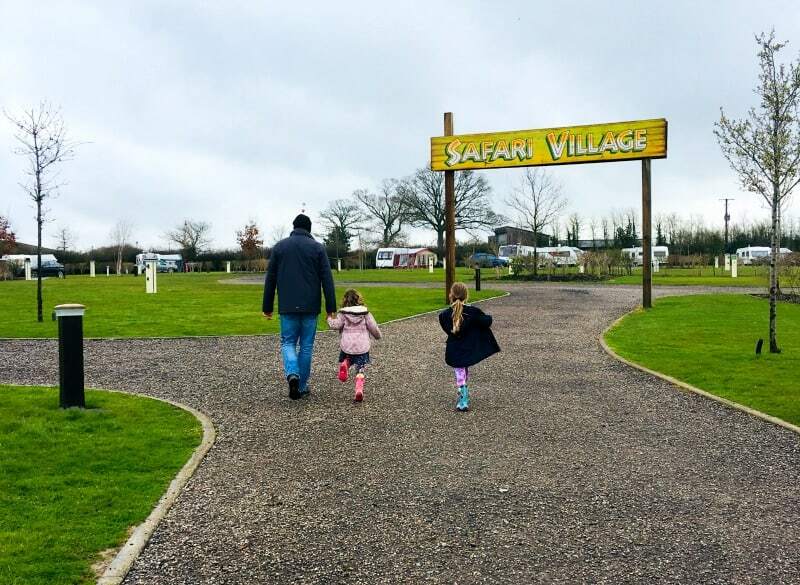 We were provided with a 3 night safari tent glamping stay at Crealy Adventure Park & Resort in exchange for this post but all thoughts and opinions are our own. How cool to have your own entrance to the park – a definite bonus of staying! Looks very snug inside as well. Your tent looks enormous, and so well equipped! Brilliant that you were even able to cook properly in there. But yes, a hot tub’s always good 🙂 The adventure park looks brilliant – I bet my two could spend days and days there. That looks like a lot of fun! We love clamping and we love Devon! It really looks fantastic Zena – I LOVE that you can park your car right by the lodge. This looks like something we would love! The safari tents look fab and well equipped and I love you had a separate entrance to Crealy. This place looks incredible! I love that there are rainy day activities too. You’ve certainly found a gem here. The safari tent looks fabulous and love how there is so much to in Crealy! Lots to do in all weathers! It looks like a really fun place for little ones. I’d love to try glamping but didn’t think it would be for us – now I know there are places with heating and proper kitchens I’m tempted to give it a go! Wow, this looks like so much fun! I do like the idea of a hot tub – definitely something to consider for next time. I’ve never been to Crealey park but will have to check it out! Devon is such a great place for kids to stay – loads of fresh air and outdoor activities to keep them occupied. I’ve recently moved to the area and absolutely love it – I would recommend it to anyone. Dartmoor is definitely worth a visit.